If an authentic and fresh Chinese cuisine in an eccentric bliss of attentiveness and relaxation is the thing that you covet, then Dubai has a bounty of such spots to feast you. Dubai offers a wide range of authentic Chinese restaurants that please you with their distinctive variety of food. Fresh noodles prepared at the live stations and unique Chinese dishes fill the menu of these swanky eateries. Some high points of these eateries incorporate the homemade recipes and delightful sauces which fill the plates of the different courses and the sides. 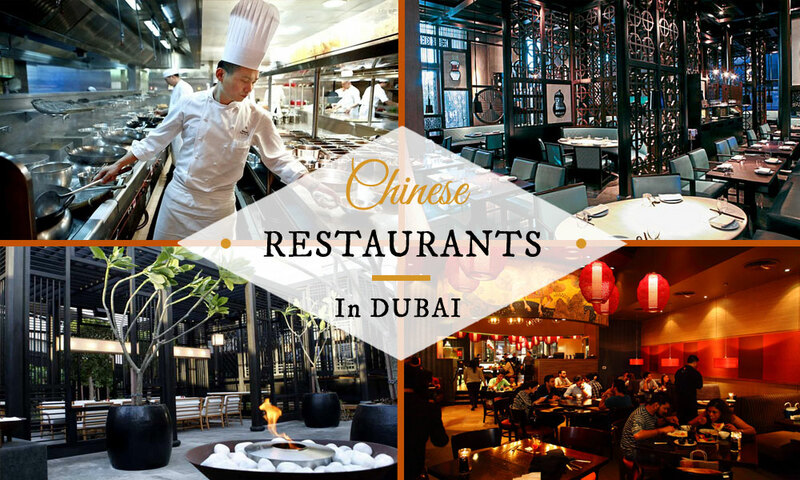 In Dubai, you may find Chinese restaurants offering extraordinary flavors, great services and distinctive ambiance. Chinese restaurants in Dubai offer a wide array of traditional mouth watering Chow Mein, Fried Rice, La Zi Ji, Chinese noodles, Jiaozi, Dim Sum and much more. If you are in Dubai today, and planning to have some Chinese cuisines in your lunch or dinner, then Dubai has plenty of options that will certainly indulge you in mouthwatering flavors. Chow Mein, Fried Rice, Jalfrezi, Manchurian, Jiaozi and Dry Chicken Chili are relatively more famous among the Chinese food. If you are looking for some authentic Chinese restaurants in Dubai, that serves typical, customary Chinese zests, then there are plenty of those in the city that can positively gratify your cravings for having delicious and traditional Chinese food. Here revealed are the best Chinese restaurants in Dubai, which offers you the best variety of Chinese cuisine. When several people search for a prime eatery, they don’t actually care for the ambiance and settings; what they actually seek, is the taste and the food itself. Lan Kwai-Fong is a similar kind of a diner where you don’t find something extraordinarily appealing in the interiors and the ambiance that hops out at you, but rather it is so tastefully and authentically flavored, and this is the thing that will persuade you every time to stroll in. Their marvelous flavors bounced off your platter because of the eminence of the ingredients and lips-smacking taste. Their ‘Duck & Plum Dip’ and Beef Chili are deadly delicious. Lan Kwai-Fong has an extensive variety of Chinese cuisine to choose from and you are sure to discover something that you want to enjoy. Lan Kwai-Fong is located opposite to the Mövenpick Hotel, Dubai. On the off chance that you are searching out an authentic Chinese restaurant in Dubai, which offers incredible food, low costs and comfortable dining settings, the Hakkasan deserves a crack. Hakkasan is one of the finest place to relish Chinese food. Hakkasan is a certified Chinese restaurant in Dubai, that is famous for the excellence of its food and services. Choose to feast inside or outside, and order your favorite from their extensive menu of mouthwatering and illustrious Chinese cuisines that will certainly gratify your hunger. The ginger chicken is the most loved here, and if you jump at the chance to take a stab at something else, the menu is entirely comprehensive and will permit you to discover something which flawlessly suits your taste. Hakkasan is situated at the ground floor of the Emirates Towers Hotel, Trade Center Area – Dubai. For those who pine for additionally rich Chinese cuisine, Zheng He `s is the place to be. Zheng He`s offering you an ultimate feasting experience. It usually serves up an enormous variety of well-known Chinese dishes, however, always adds something exceptional to the cuisine. For instance, dumplings served with delicious dark truffle give an exceptional and succulent flavor to those who prefer their food to be lacy and rich. Concerning the ambiance and interior, if you adore conventional Chinese services with modern day aptitude, Zheng He`s won’t dishearten you. The Chinese restaurant offers you a classy eating experience with a complete variety of delectable Chinese cuisines. The Zheng He restaurant is located at Jumeirah Mina A’ Salam, Madinat Jumeirah – Dubai. Another great place for having delicious Chinese food in Dubai is P.F. Chang’s China Bistro. Situated at the ground level of Mirdif City Center, P.F. Chang’s China Bistro emanates class, style and ridiculously delicious entries in its menu. Their Beijing duck is superbly tender and seasoned and the noodles are perfectly cooked and remarkably fresh. Staff of P.F. Chang’s China Bistro always aim to please you with their best while endeavoring high that the customers leave the place delightfully, taking along a memorable dining experience. P.F. Chang’s China Bistro is surprisingly affordable too, as it will cost you merely AED 200 for two persons, including starter, main course meal and a drink. If you are searching for great Chinese eatery near Dubai Marina, then the best among there is Peacock Chinese Restaurant. This is the most famous Chinese restaurant in Dubai Marina that offers a great variety of Chinese food and flavors. Their delectable sauces, jumbo prawns, Chicken Manchurian and Szechuan beef are heavenly. The Peacock Chinese Restaurant in Dubai is an amazing choice if you want to eat the usual Chinese stuff with an unusual twist. The eatery is simple yet delighting. The Peacock Chinese Restaurant is located at the Al Sufouh Rd – Dubai Marina. These are some of the most amazing Chinese restaurants in Dubai, where you can enjoy the best Chinese flavors in Dubai. For further suggestions please, comment below.